On Saturday at the Brooks PR (High School) Invitational, Rockdale County H.S. 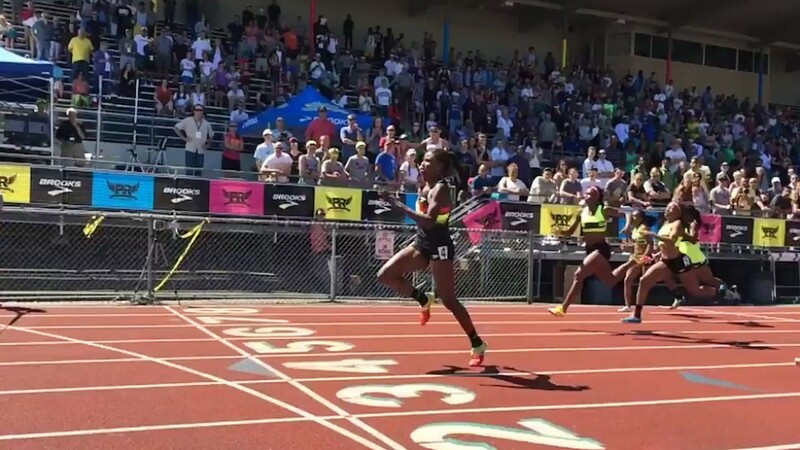 sophomore Candace Hill ran 10.98 for 100m, a National High School Record, an American Junior Record, and the fastest time ever run by a 16-year-old girl. That time also makes Hill the 10th fastest woman in the World in 2015. You can watch the race here. Hill’s time left many in shock, including Hill herself, who admitted after the race that running under 11 seconds was a goal for maybe her junior or senior year, but not for this season. It also seems to me that it’s taking a while for Hill’s performance to fully sink in. What does it mean for a 16-year-old to break 11 seconds, a barrier that the IAAF calls “the benchmark of the world’s elite?” On the message boards, some had the knee-jerk response that such a performance isn’t possible without illegal assistance… such is the current climate of skepticism and cynicism. But I think the “too good to be true” response is too simple. There’s a good case to be made that Hill’s race at the Adidas Grand Prix meet on June 13th where she ran a personal best 11.21 into a -1.5 m/s wind was a superior performance to race at the Brooks PR meet. At Brooks, she and the rest of the field benefited from the maximum legal tailwind, measured at +2.0 m/s. After she saw the time, Hill herself thought “It had to be illegal,” meaning that she thought the tailwind much greater. Several people have pointed out that after applying a correction for the wind, the performance at Adidas was superior to the performance at Brooks. (11.21 with -1.5 m/s converts to 11.09 with no wind; 10.98 with +2.0 m/s converts to 11.10 with no wind). In other words, both races were extraordinary, but the 10.98 wasn’t necessarily more extraordinary. Nevertheless, and however much the wind helped, that 10.98 stands out as MORE significant than another high school boy running a sub-4:00 mile. In her interview with Flotrack after the race on Saturday, Hill was asked repeatedly what this means for the future. She wisely avoided saying anything specific and emphasized that she was surprised to run so fast, and just wanted to keep improving. I found the persistent questions annoying, and beside the point. Even though the time is what is getting all the attention, the point is that Hill appears to competitive with top sprinters at the NCAA level, and perhaps at the world level. This entry was posted in High School Runners and tagged Candace Hill. Bookmark the permalink.